These were produced for the UK and Europe in the following designations at different times during the model’s lifespan: 280SL 6 Cyl, 300SL 6 Cyl, 350SL V8, 380SL V8, 420SL V8, 450SL V8, 500SL V8. There was also a 560SL V8 built solely for the US, Japanese and Australian markets, of which a few have found their way back to Europe. As might be expected with a car which was produced over an 18 year period, there are significant improvements incorporated in the later variants. Early 350SL and 450SL cars from the 1970’s tend to be quite thirsty and not so well protected from rust, and of course tend to be higher mileage and more worn with age, however a cherished example from this period is still a very nice car to own. 280SL, 380SL and 500SL cars from the early 1980’s had lighter and more fuel-efficient engines, better rustproofing and also some improvements to the running gear. The most sought after (and thus most expensive) cars are those from the final years 1986-1989. These are the 300SL (3 litre straight six), 420SL (4.2 litre V8) and 500SL (5 litre V8) models, which benefit from galvanising to vulnerable areas, lighter and more modern engines, better suspension, revised seats, bigger wheels, tyres and brakes and subtle freshening of line around the frontal area. A well cared for car from any year will always be a delight to own, but all other things being equal, the later it is, the better it will be. In common with all SL variants this model is strictly a two-seater, though an option from the factory was to have a token rear seat which is only suitable for small children. The soft top is manually operated and unlined, with plastic windows, but is of high quality and should be totally weatherproof (but see our page on powered soft tops for this model). However all variants come complete with a heavy-duty metal hardtop which transforms the car into a snug coupe for Winter use. With such a long production run it is quite bizarre that examples of this model were already being displayed in motor museums before production had actually ceased! The driving experience of the R107 is a bit more traditional than the other models discussed here, and indeed that is part of the attraction. However it is perfectly at home in modern traffic conditions, and very practical to use as a stylish and distinctive every day car for journeys of any distance. 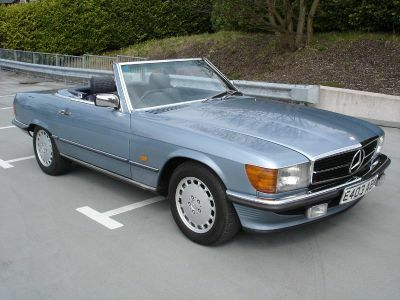 As with the earlier SL models, this model is strictly a two-seater, though an option from the factory was to have a token rear seat which is only suitable for small children. The soft top is power operated and of very high quality, though still unlined with plastic windows. As before it is supplemented by a standard heavy-duty metal hardtop for Winter use. From about 1996 this model was offered with an optional panoramic glass-roofed hardtop, which gives a very space-age feel from the inside. As with the R107, many technical improvements were made during the model’s 13 year lifespan, though not as marked. There were also several cosmetic changes made over the years to lights, grilles, mirrors, bumpers, interior trim and wheels to keep the model looking fresh, though when viewed from this far into the future they seem very minor. Any well maintained R129 is a good purchase, and will not be found wanting in any area when compared with a car of today. These were produced in the above four body styles (plus limousine, ambulance etc.) and with many petrol and diesel engine options from 2 litre to 5 litre. Most interest is focussed on the coupe and cabriolet, but the saloon and estate are also very elegant and desirable cars of their generation. 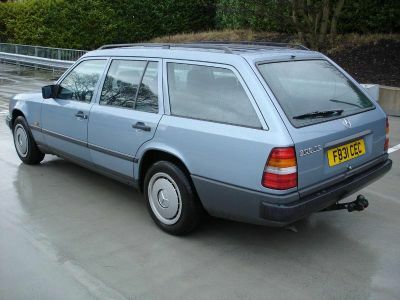 The saloon and estate versions are rarely found in good condition nowadays as most have led a hard life with reduced maintenance as they have got older. The estates in particular are very hard to find as their phenominal load carrying qualities have meant that most have become very tired and worn. From 1985 to 1993 the engine choice in the UK was either 2.3 litre 4 cyl or 3.0 litre straight 6, with a 24 valve version of the latter available from 1989. In the final period from 1993 to 1996 these engines were replaced by the more modern 2.2 litre 4 cyl and the 2.8 or 3.2 litre straight 6. Any of these engines is a good and durable choice, but the 6 cylinder versions tend to be more favoured, as much for the added smoothness as the extra power. The coupe was introduced early in the model’s life, but was built in much smaller numbers than the saloons and estates and is quite rare. In appearance it has a style and purity of line lacking in later models, but with the bonus of having a practical four-seat configuration. From 1986 to 1993 the engine choice in the UK was either 2.3 litre 4 cyl or 3.0 litre straight 6, with a 24 valve version of the latter available from 1989. In the final period from 1993 to 1996 these engines were replaced by the more modern 2.2 litre 4 cyl and the 3.2 litre straight 6. Any of these engines is a good and durable choice, but the 6 cylinder versions tend to be more favoured, as much for the added smoothness as the extra power. 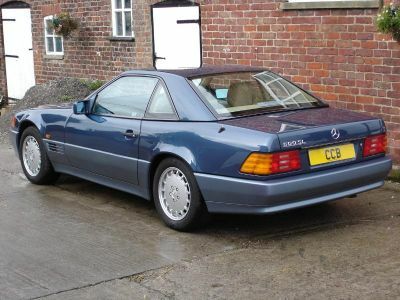 The cabriolet did not appear until 1992. This, together with its high purchase price when new, accounts for the fact that only 789 of the 2.2 Litre E220, 557 of the 3.2 litre E320 and 14 of the 3.6 litre AMG cabriolets were sold in the UK. This makes it one of the rarest of recent mainstream Mercedes models. Unlike the SL, a hardtop was never offered by the factory for this model (though one was available independently from a company called Wiesmann). The standard power operated hood is heavily insulated, with a heated glass rear window, and is designed for all-year-round use. The quality is so good that with the hood up in an E Class cabriolet one can easily forget that it is a convertible car. 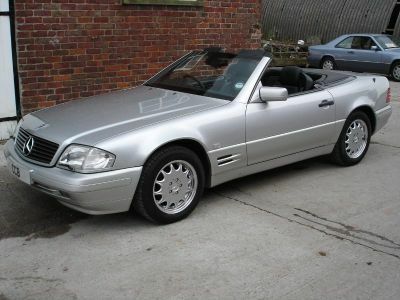 The E Class cabriolet was the first four seater convertible from Mercedes after a gap of over 20 years. 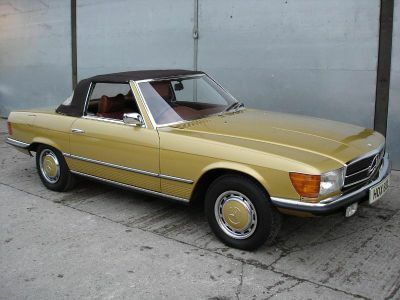 It was a worthy successor to the 220 and 280SE cabriolets of the late sixties and early seventies. The combination of its beautiful lines, rarity and practical four seater configuration makes it highly desirable and increasingly sought after. An extremely rare version was the 500E/E500 saloon assembled by Porsche for Mercedes-Benz and only available in LHD. This used the 5 litre V8 engine and much of the running gear from the 500SL/SL500 and was a technical tour-de-force for its time with scorching performance and handling. The same body style lasted for the entire life of this model, with minor facelifts and modifications to the underpinnings at intermediate stages. Various petrol and diesel engines were offered, from 1.8 to 2.6 litre. There were high performance 2.3 and 2.5 litre 16 valve versions, (known informally as ‘Cosworths’ in the UK due to the cylinder head being designed by that company) and also the firebreathing EVO I and EVO II models based on the German saloon championship cars. 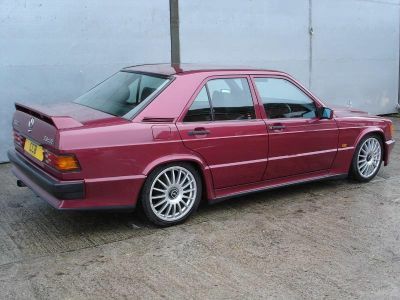 As Mercedes-Benz’s first foray into the smaller end of the market, the 190E was at first viewed with suspicion by the cognoscenti. 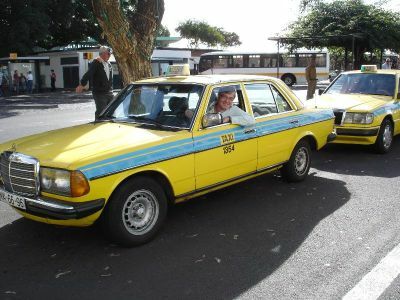 However it rapidly gained acceptance when it became clear that it was just as good as any other Mercedes – only smaller. 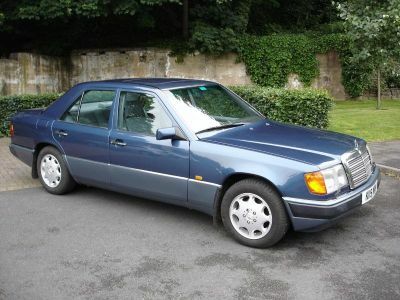 Virtually the full options list was offered, as with the larger cars, so a 190E “Mini-Merc” could be specified with all the creature comforts of leather, air conditioning, electric seats, sports suspension etc. This could still be a very expensive car compared to its downmarket rivals. 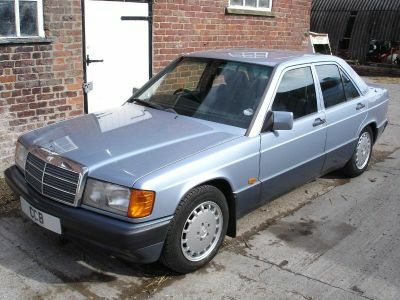 The 190E makes a perfect starter classic Mercedes, though being the smallest and cheapest of the range many have fallen into the wrong hands as they have got older and been heavily used with poor maintenance. A well cared for example with good service history is a lovely possession however, and just as satisfying to own as any of the more exotic models. It also has the undoubted benefit of being a very practical everyday car. This model was produced in the above three body styles (plus specialist variants) with 2.0, 2.3, 2.5 or 2.8 litre petrol engines and 2.4 or 3.0 litre diesels, including a 3.0 turbodiesel in LHD form only. It is an extremely strong car, and many thousands of them still do sterling work as taxis in developing countries around the World. At the 20 to 30 year age group that most of these cars currently fall into there are unfortunately a great number of very poor quality specimens about, which have survived for many years on a sparse maintenance regime coupled with very hard use over high mileages. The superb original design and build quality of the W123 means that they will soldier on almost for ever, despite serious neglect and abuse. When purchasing them for stock we reject the majority of the cars we are offered, and subject the remaining ones to very thorough examination of both the car itself and the documentation attached to it. Only a very few cars make it through to be offered by us for sale. These examples are truly representative of the qualities which made them so great when they were new, and are a delight to own and drive. 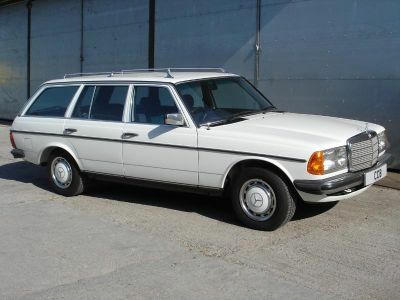 The coupe is a very stylish classic, and the estate has a period charm which makes a very strong “lifestyle statement” for those who choose to use it as an everyday car in preference to a modern equivalent. The saloon is also a very elegant and practical car of its generation, and is rapidly gaining popularity with classic Mercedes enthusiasts. 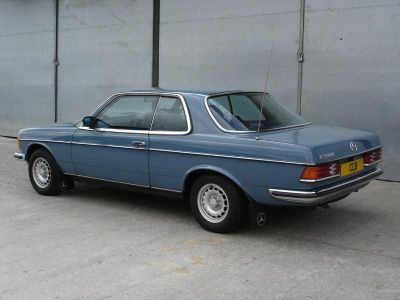 This model was produced in the above two body styles (the saloon in standard or long wheelbase) with 2.8, 3.0 and 3.2 litre “straight six”, 4.2 and 5.0 litre V8 and 6.0 litre V12 petrol engines. The coupes were only ever available with the V8 and V12 engines. Turbo diesels were produced in LHD form only and were never officially sold in the UK. The early saloons were designated SE, or SEL for the long wheelbase versions, e.g. 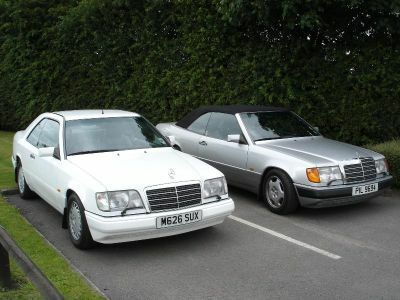 300SE for a standard wheelbase 3 litre and 500SEL for a long wheelbase 5 litre. They later had an S prefix on the badging, with an L suffix to denote the long wheelbase versions, e.g. 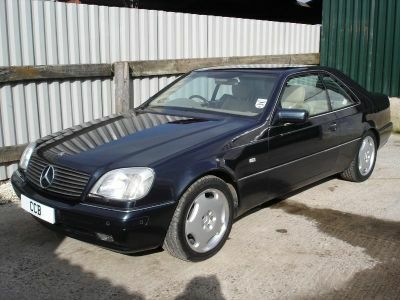 S280 for a standard wheelbase 2.8 litre and S600L for a long wheelbase 6 litre. Badging on the coupes was more complicated as it changed twice during the model’s life. Early cars were badged as SECs, e.g. 500SEC. In 1993 this changed to just S, e.g. S600 and later still it was renamed as the CL e.g. CL420. There were no significant changes to the specification during this time other than a change from 4 to 5 speed gearboxes and certain engine upgrades around 1996. In its day this was Mercedes’ technical tour-de-force, with almost every available feature being standard on the coupes and optional on the saloons. Things like double glazing, self-closing doors and electric assistance for everything adjustable were revolutionary at the time and are still quite remarkable. 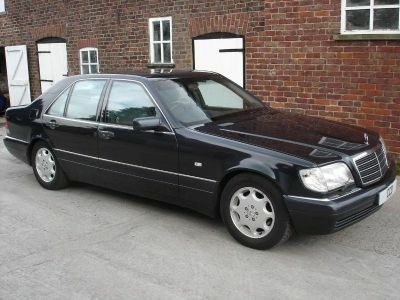 They have proved to be amazingly durable cars, more so than later S Class models, and provided one is chosen which has all the evidence of being well cared for and sympathetically used there is no reason to fear the complex systems on board. The ride is sublimely cossetting and the smooth delivery of the huge power available from the V8 and V12 engines is addictive. The smaller engined six cylinder cars are no sluggards however, and have the added bonus of surprisingly good fuel economy, though even the V8s can return good fuel consumption figures when driven in a relaxed style. At current prices these have to be one of the best value buys of any Mercedes model of our era, and will respond superbly to any demands which are made of them.